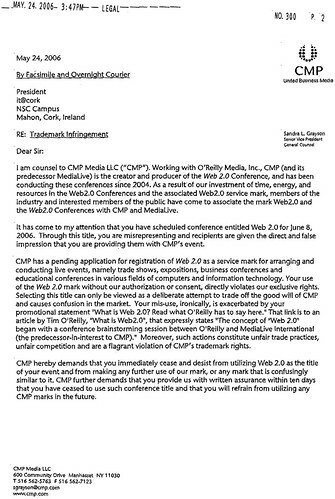 According to his blog, Tom Raftery has been sent a C&D latter (Cease and Desist) by lawyers working on behalf of CMP Media (who organise the Web2.0 conference with O’Reilly). They are asserting that he is not allowed to use the term “web2.0” in his does-what-it-says-on-the-tin “IT@Cork Web 2.0 half day Conference” named event. I simply can’t believe O’Reilly are doing this, and I almost feel like the need to check my calendar to confirm it’s not April 1st! How un-web2.0 could you possibly get? This is CMP we’re talking about – what do you ecpect? As fas as I know Dale Dougherty and Tim O’Reilly coined the term Web 2.0 for a conference in 2004. I don’t see a reason why they shouldn’t have exclusivity if they ‘invented’ it and have a valid trademark to use that work in the conference context.